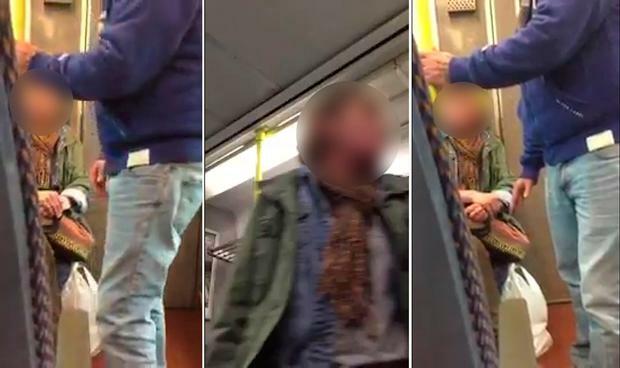 A series of videos recording an Irish woman's racist rant on a Limerick train has been reported to the Gardaí by Irish Rail. In the videos, which were originally posted to Twitter, a woman can be seen and heard making expletive-ridden comments towards fellow passengers. Twitter user 'TheBexWay' filmed the woman on a train from Limerick Colbert station to Limerick Junction on Sunday. She messaged the Irish Rail account during the trip, saying the woman had been making abusive comments for ten minutes. According to the Twitter user, who did not want her name published, the woman was reacting angrily to another passenger having a bag on a seat. "F**k off back to India. Don't give me your guff, you f**king cheeky p***k.
"Respect my f**king country and get your bag off the seat." The woman then took aim at another passenger who appeared to stand up for the people she was abusing, saying: "look at the ugly head of that fella." "That's the only reason he's backing you up is because he's ugly." According to the publisher, the passengers left their seats after 16 minutes of verbal abuse. "You don't really get the full effect of what happened from the video. She was literally sitting beside them, screaming bloody murder in their faces. It went on for almost the whole train ride," she said. "I didn't feel safe. If that turned into a fist fight, there would have been nobody there to help us." A spokesman for Irish Rail told Independent.ie that behaviour like this will not be tolerated on their service. "People should be able to travel on our services without abuse of any kind," he said. "The footage is very clear and very shocking and we welcome the fact that another member of the public was able to assist in identifying the person involved." In March, a study issued by the European Network against Racism Ireland (ENAR Ireland) found that there was an alarming growth in the number of racism incidents being reported over the last six months. A total of 245 reports were made in that time frame, which is an increase of 55 in the previous period. Victims of racist abuse can make a confidential report by visiting ireport.ie.